I love good lox. Having lived in Beverly Hills, CA, I frequented Nate ‘n Als (established in 1945) a lot and they had the best lox ever. Oh well, that was awhile ago and now I’m in a place where we do not, so far, have a Nate ‘n Als. I wish we did so that I could revisit my childhood delights more frequently. I don’t travel much to Beverly Hills anymore and even though Nate ‘n Als supposedly delivers most everywhere in the US, that’s pretty pricey. 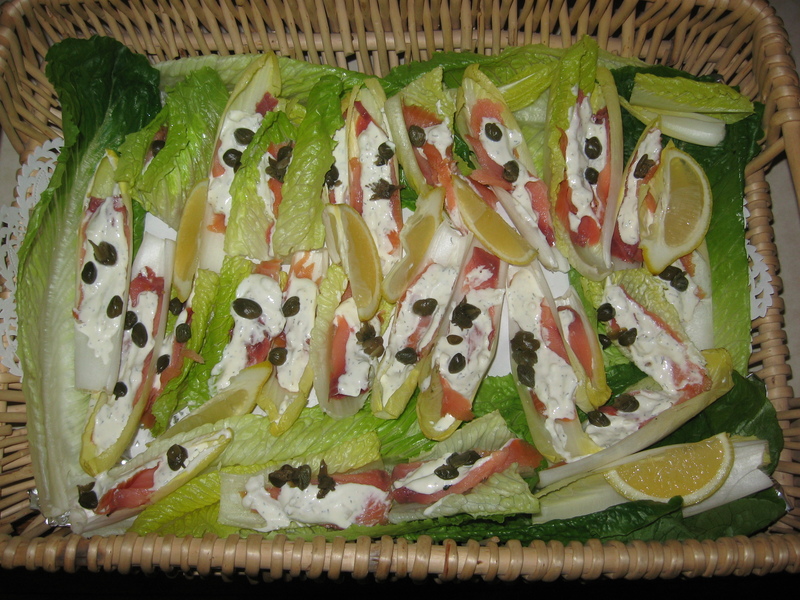 In any case, if you also like lox and some good unpackaged lox is available here in the valley, here’s a simple appetizer dish that is always a hit. Buy as much of good lox (preferably not pre-packaged) you wish to use. Buy a combination of Belgium Endives and fresh Romaine Lettuce (as much as you visualize that you’ll need. Left over’s always makes for a great salad. Also you’ll need the ingredients listed below for the Dill Sauce. Mix the above Dill Sauce ingredients in a small bowl. You can make this at the last moment however if you refrigerate this sauce for several hours it’ll make it taste even better. On individual Belgium Endive and Romaine leaves, place a bit of lox and top it with the dill sauce and finalized with some capers. Place on a pretty dish surrounded by some lemon slices.